Born in Amsterdam in 1942. My interest in arts became established during the 1960’s in the film industry. In 1970 I set up my own film company, and produced and directed commercials, company films, animated films, documentaries, and instruction and education films. During the 90’s the 2-dimensional gave way to the 3-dimensional in the form of sculpture. My sculptures are inspired by my feelings and passions at the time. I have experimented a good deal and worked with various mediums, of which my preference has become stone and steel. 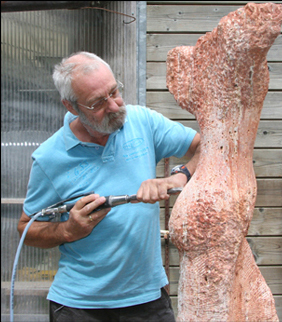 In recent years I have regularly worked at different studio’s in Pietrasanta,Italy (studio Pescarella, studio Shakti and La Polveriera) from time immemorial an international gathering place and centre for sculptors. The name Pietrasanta, which means "holy stone", indicates its most important industry: Marble.